Lohmeyer Vehicle, Antique & Collectible Online Auction — Harritt Group, Inc.
10% buyer’s premium on each lot added to hammer bid price to determine final sales price. 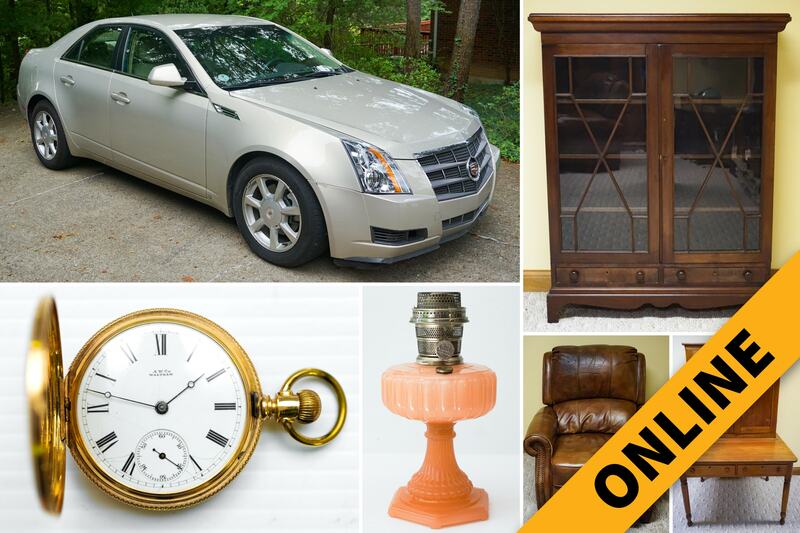 Selling the private collection of Bill and Jo Lohmeyer including a 2008 Cadillac CTS, their Aladdin lamp collection, 14K gold & filled vintage pocket watches, antique clocks, antique furniture, collectibles, power, yard & hand tools and more. 2008 Cadillac CTS, 4 Door Sedan, 6-cylinder, 3.6L, all wheel drive, gold mist with leather interior, 56,242 miles, VIN No.1G6DS57V280152094. Circa 1874 Waltham 14K gold pocket watch engraved with initials from a Plaskett Family member from Bethlehem, IN, Lanco Swiss art deco 17 jewels pocket watch, Hamilton Railway Special 10K gold plate 21 jewels pocket watch, Waltham gold plate pocket watch in stand and a Movado 14K Gold Museum Classic black dial mechanical Swiss wristwatch. 1929 New Albany National Currency ten dollar bill signed by Frank Fougerousse & GA Newhouse, 1917 one dollar bill, 1923 one dollar bill, 1922 ten dollar gold certificate. 1800’s cherry 2-door bookcase w/8-pane geometric glass doors, walnut 2-piece plantation desk, oak hat box dresser, Tell City hard rock maple rocker, English walnut side cabinet, Victorian marble top lamp table, English oak side cabinet, antique multi-drawer jeweler’s bench, Floyd County Courthouse Juror’s chair, 1970’s pecan china cabinet, club style brown leather recliner, club style brown leather button tuck sofa and 4-piece wood patio set. Octagon wall regulator clock with hand-painted dial and great patina, Junghans Westminster mantel chime clock New York, German Black Forest hunt themed cuckoo clock, 1800’s round bell chime regulator wall clock made by Chauncey Jerome New Haven, Connecticut, Gilbert 1881 steeple clock, Winchester Connecticut painted steeple clock, Seth Thomas mantle clock, Sessions double column mantle clock, French Aiguilles brass carriage clock, reproduction 31-day wall regulator clock made by Markey Hankins and assorted clock parts. 50+ Aladdin oil lamps including No. 8 hanging Aladdin lamp, table lamps including Corinthian, Lincoln & Washington Drape, Orientale, Beehive, Moonstone, Cathedral, Colonial, Genie, Vertique, Brass, Nickel & Chrome and more, brass & glass fonts, electric urn lamp, 20+ Aladdin glass table lamp shades including 550 Swiss alps scene, bullseye, artichoke, painted, satin and others, Aladdin finials on display stands, several Aladdin chimneys, parts & accessories, Aladdin Collector Club memorabilia and more. 1920’s smoke stand humidor, (18) Regina music box discs, Model 231 brass carriage lamp by The Castle Lamp Company Elmira, N.Y., cast iron donkey bottle opener from Roosevelt Convention, Robbins & Myers No. 1159 brass blade fan, Schoenhut toy horses & donkeys, Steiff toy donkey, cast iron donkey still bank, donkey shot cup & opener and others, pair of Keen Kutter ice skates from Simmons Hardware Co. size 11 1/2, (2) Courier Journal printing stones, Lionel 248 O-gauge engine and cars, ice tongs, vintage fireplace tools, retro coffin cigarette box, small brass bucket, vintage pipes, handmade wood toy car, set of 22 graduated numbered sleigh bells on leather strap, antique youth rocker & baby carriage, (3) Zimmerman paperweights and others, painted coal hod, shaker youth chair, cast iron match safe, Bruce Fox leaf & double horse head letter opener, sterling compote & pair of weighted candlesticks, assorted silver plate, 16-pieces of Flagg & Homan pewter ware, Griffin Shinemaster box, Hohner harmonica w/box, Indianapolis souvenir plate, Corydon Capital & Scribner House collector plates, sad irons, arts & craft metal trash can, The Complete Works of James Whitcomb Riley Volume 1-10, Elsie’s Girlhood books, assorted vintage books & coffee table books, 1950’s Deutschland and Heidelberg bookends, framed prints including Paul Sawyer Mill Pond print, European landscape & street scene prints, Don Ensor Sew Peaceful print, James Leonard Spring Mills print, Saint Benedict print, pair of William Hancock Historic Main Street New Albany series prints, framed vintage postcards, vintage sled, oil cans, blue mason jars, Purity Maid milk bottle, 1934 Indiana license plate, Bucking Bronco statue, iron egg baskets, galvanized wash tub, copper wash boiler and milk can. Craftsman drill press, band & table saws, Dremel scroll saw, Ryobi router and stand, Stihl MS210C chainsaw, Echo SRM 210 weedeater, tool bench w/ grinder, levels, saws, clamps, hammers, chisels, power & hand tools, bar clamps, Foredom electric flexible shaft drill, industrial work stool, tool boxes, kerosene heaters, ultrasonic parts washer and gas cans. Small Magic Chef chest deep freeze, AOC Envision flat screen TV, Sony radio CD player, modern home decor and bird feeders. I-265 to State Street Exit #1. South 3/4 mile to right on Captain Frank Road. Continue right at 3-way on Captain Frank Road to left on Old Vincennes Road. 3/10 mile to left on Woodmount Drive. 2nd home on right.